Deloitte’s global ambition to reach 50 million lives through the WorldClass programme means that by investing in education, skills development and access to opportunity we can impact and support people’s lives in a meaningful way that is aligned to our core skillsets and resources. Our volunteer programmes in Ireland are closely linked to educational charities and initiatives. However, we also have an overseas volunteer programme with a charity whom we have been partnering with for the past 6 years. Nurture Africa are an Irish registered charity whose work is based in Uganda. They support people who are affected or infected with HIV and/or AIDS through education programmes, healthcare and access to opportunities with their microfinance programme and vocational training centre. 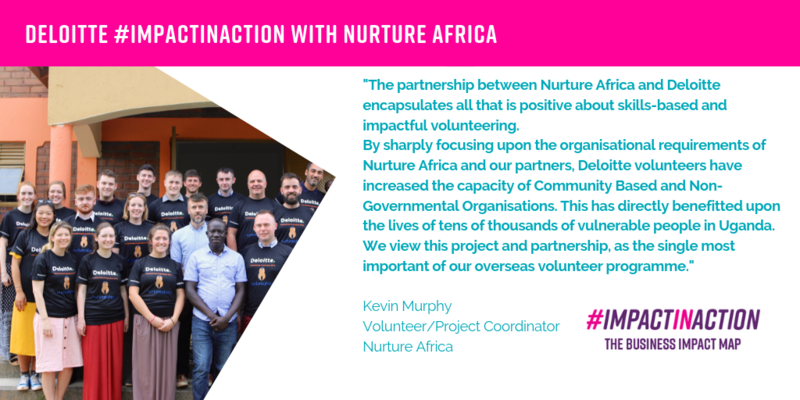 In our focused and collaborative approach to a skilled volunteering placement for our volunteers and for the charity, we work very closely with the Nurture Africa team in Ireland and in Uganda. Each year of the volunteer programme, we continue to build on the work that has been completed previously and to improve the programme for the volunteers involved as well as those working in the charity and beyond to the community they serve. Our main area of focus in our work with Nurture Africa is with SDG 4; Education. Our volunteers work very closely with the Nurture Africa team to capacity build both the staff in the charity and its partner organisation’s staff by creating innovative solutions to challenges encountered within an overseas development setting which is supported by Irish Aid (this addition makes the input much greater than Deloitte supporting a small organisation). Currently, the implementation of these processes support a stronger delivery of services to which the following are impacted: over 4,000 children in education, 17,000 in HIV treatment and care, primary healthcare & maternal health and 500 families supported by income generating projects. From a development education perspective (SDG 4.7), Deloitte volunteers meet with service providers and users across a range of projects in order to enable a greater understanding of the varying daily challenges people living in poverty face in such a resource constrained environment. Over the years, more than 100 Deloitte volunteers have contributed over 7,200 volunteer hours and over €110,000 in donations by helping to implement change into a fast paced and innovative charity, assisting with its transition to attain a self-sustainable model with new and improved services and support to those in the local community.